Dr. Brian Winkel, Professor Emeritus, Mathematical Sciences, United States Military Academy, West Point NY USA and Director of SIMIODE. I cannot accept that mathematics be taught in a vacuum. Yes, mathematics is beautiful, be it pure or applied. However, in our age of immediacy for students we need to move more of our efforts to teaching mathematics in context, in touch with the real world. We should incorporate more modeling and applications in our mathematics courses to richly support and motivate our students in their attempts to learn mathematics and we should support colleagues who seek to use this approach. Over the course of time I have moved to this position. At first I used applications of mathematics in course lectures, e.g., error correcting codes in algebra, cryptology in number theory, life sciences in calculus, and engineering in differential equations. Then I assigned students to read articles in other disciplines and share these applications in class. Finally, I incorporated projects in which students could see and practice the application of mathematics. Introducing a modeling scenario makes the mathematics immediate; what do I do right now? Students desire to address the problem at hand, which is real to them, primarily because it intrigues them and piques their curiosity. Thus the mathematics becomes a necessary tool they are ready to learn. I eventually used the application to motivate the learning of the mathematics before introducing that mathematics. This is a “flipping” of content. Some students are a bit shy, even resistant, to this approach. However, in an active and supportive learning environment in which students work in small groups and the teacher works the room by watching, visiting, listening, and assisting the groups, students do amazing things. Sometimes they get off a workable track, but colleagues and teachers bring them along. Students make mistakes, but as we know, learning from mistakes is an important part of learning [BrownEtAl2014]. Indeed, we do it all the time ourselves and call it conjecture and research. For some time, many colleagues have been calling for using modeling in the mathematics curriculum, be it after the introduction and practice of the mathematical topics or before the mathematics is introduced. An example of the latter is to give elementary school students objects – lots of them – and ask them to describe what they have. Quite often, and quite naturally, they will settle on one attribute, e.g., color, weight, size. The vehicle for description is usually an organized list and quite often an associated visual; something we would recognize as a histogram. We need not formally introduce the notion of a histogram; rather just name it after our students invent it for their immediate purpose. At a more advanced level, one example [Winkel1997] is to ask students to put one eye on a point on a hillside opposite a mountain across the valley and describe what they can see. In the course of their investigations students invent the notions of partial derivative, tangent plane, and normal to a surface. In another activity [Winkel2008], students invent Fourier series by coming up with the rather natural criteria for measuring best fit of a trigonometric series, motivated by images of spectra from chemistry, voice studies, and seismology. In [LibertiniBliss2016] the authors demonstrate that one can cover traditional topics and techniques in differential equations courses and also introduce rich modeling activities to motivate and consolidate learning. We have found that when students see a modeling situation first, it really motivates the learning of the differential equations material and their grasp of the mathematics is firmer and lasts longer because of the modeling experience. Indeed, Dina Yagodich, of Frederick Community College, says that throughout the semester her students refer to a first day of class activity on death and immigration modeling with simulations using m&m candies [Winkel2014], an indication of the importance and meaning of a modeling first approach to teaching. In the 2015 CUPM Curriculum Guide to Majors in the Mathematical Sciences, described by Martha Siegel in this AMS Blog [Siegel2015], there is rich support for applications and use of technology in many mathematics courses. From the Course Group on Differential Equations of the CUPM Curriculum Guide material [CUPMODE2015], we note, “There are major applications involving differential equations in all areas of science and engineering, and so many of these should be included in the ODE courses to show students the relevance and importance of this topic.” In the section, “Technology and the Mathematics Curriculum,” of main report [CUPM2015] there is strong encouragement to include technology wherever possible as its use enhances understanding and enables more sophisticated modeling and applications, thereby motivating students. For years COMAP [COMAP2016] has enriched the repertoire for teachers who seek to motivate mathematics through modeling and application with the production of UMAP Modules, journals, texts, videos, and modeling competitions. I have worked with students who took the Mathematical Contest in Modeling and the Interdisciplinary Contest in Modeling [MCMICM2016] offered by COMAP. This is a four day, team of three, competition in which students apply the mathematics they know and learn lots more mathematics en route to solve a real world problem. Students always say, “This is the best mathematical experience in my life.” Hands down the students tell us that applying mathematics in context and on the spot for the competitions in order to build a model is the most rewarding experience of their undergraduate mathematics. The Society for Industrial and Applied Mathematics (SIAM) and COMAP have recently released a powerful report, Guidelines for Assessment and Instruction in Mathematical Modeling Education [GAIMME2016], in support of modeling throughout the mathematics curricula from K-16. This report is rich in support of why, what, how, and when to both introduce and assess/evaluate modeling efforts in the classroom. The report encourages and supports faculty with little experience in modeling to get into the game and offers practical suggestions and illustrations which should enable more faculty to incorporate modeling in their teaching. We offer an effort to include modeling in one course, differential equations, in the hope that others will join the effort and also do so in other courses. We have created a freely-available community for teachers and students called SIMIODE — Systemic Initiative for Modeling Investigations and Opportunities with Differential Equations. SIMIODE is about teaching differential equations using modeling and technology upfront and throughout the learning process. You can learn more at our dynamic website www.simiode.org [SIMIODE2013] where we offer a community in which colleagues can communicate, contribute, collaborate, publish, teach, explore, etc. SIMIODE is a teacher repository of materials and references to other useful sources of materials and ideas concerning teaching differential equations using modeling and technology. SIMIODE offers a growing set of Modeling Scenarios. These are key pedagogical components of SIMIODE in which a modeling situation, rich in detail, motivates the study of differential equations. Additionally, there are Technique Narratives which provide techniques and strategies for solving differential equations with motivating examples, activities, and exercises. These materials are double-blind, peer reviewed, and published on-line at SIMIODE. In addition SIMIODE offers videos from which students can collect their own data for modeling with differential equations, both at SIMIODE [SIMIODE2013] and at SIMIODE’s YouTube Channel [SIMIODEYouTube2014]. Examples for learning differential equations with modeling from SIMIODE include such topics as chemical kinetics, sublimation process, Torricelli’s Law, feral cat control, dialysis, word propagation, mixing fish, spread of oil slick, ant tunnel building, pendulum study, machine replacement, pursuit, drug administration, spring mass configurations, shuttlecock fall, design of stadium, hang time, malaria control, electric circuit, whales and krills, and many more. In each case a scenario, often with data, is offered and students are supported in building differential equation models to address the situation. Quite often the model comes before the introduction of the formal differential equation, indeed, the model motivates the mathematics. 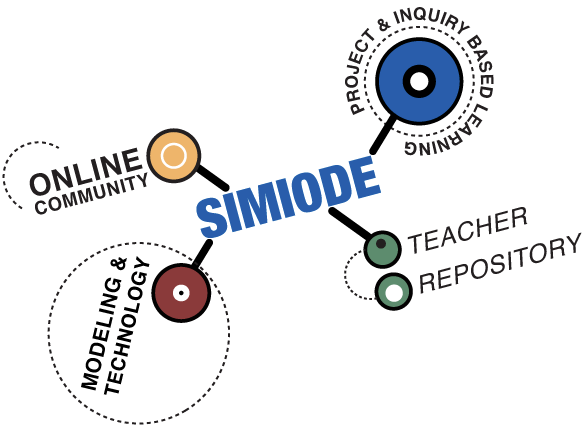 SIMIODE is project and inquiry-based learning at its core, for teachers can find (and create and publish their own) activities in which students discover and build differential equation models to address the scenario offered. The use of technology, as appropriate, encourages a rich solution space, addressing technical, graphical, numerical, and symbolic issues in order to demonstrate techniques and address issues for the model under study. Technology permits deeper understanding and richer analyses. Most importantly, SIMIODE is a community of teachers and students, wherein teachers can collaborate in building modeling opportunities, address issues appropriate to their interests and the interests of their students, and reach out to new colleagues who are interested in teaching differential equations using modeling as the motivation for the subject. Within SIMIODE teachers can build their own course, form groups based on common themes from class rosters to special student teams, and can work on projects with colleagues and students from different campuses. SIMIODE is sponsoring minicourses at both MathFest in August 2016 and the Joint Mathematics Meetings (JMM2017) in January 2017 as well as conducting a Special AMS Session, “Experiences in teaching differential equations in a modeling first approach,” at JMM 2017. Thus, there is ample opportunity to get first-hand experience in this approach to teaching in addition to collegial support from the on-line community at www.simiode.org. The message is this: Students can learn mathematics in context and we should use mathematical modeling and technology to teach mathematics. The encouragement to use modeling in mathematics coursework and support is growing in the form of resources, professional society encouragement, collegial conversations, and support communities such as SIMIODE. Just as with radio waves that are everywhere, our receivers tune in and pick up this message about the joy and power of using modeling in mathematics instruction. More importantly, many are engaging due to what they see and hear. We invite you to join us. [BrownEtAl2014] Brown, Peter C., Roediger, Henry L., and McDaniel, Mark A. Make It Stick: The Science of Successful Learning. Belknap Press, 2014. [COMAP2016] The Consortium for Mathematics and Its Applications. 2016. www.comap.com. Accessed 17 May 2016. [CUPM2015] 2015. CUPM. 2015 CUPM Curriculum Guide to Majors in the Mathematical Sciences. Editor Paul Zorn. http://www.maa.org/sites/default/files/pdf/CUPM/pdf/CUPMguide_print.pdf . Accessed 2 May 2016. [CUPMODE2015] Devaney, R. 2015. Ordinary Differential Equations Course Report. http://www2.kenyon.edu/Depts/Math/schumacherc/public_html/Professional/CUPM/2015Guide/Course%20Groups/OrdDiffeq.pdf . Accessed 5 May 2016. [GAIMME2016] COMAP and SIAM. 2016. Guidelines for Assessment and Instruction in Mathematical Modeling Education (GAIMME). http://www.comap.com/Free/GAIMME/index.html . Accessed 1 May 2016. [LibertiniBliss2016] Libertini, J. and K. Bliss. 2016. Using Applications to Motivate the Learning of Differential Equations. To appear in Association for Women in Mathematics publication. [MCMICM2016] MCM/ICM. 2016. Mathematical Contest in Modeling and Interdisciplinary Contest in Modeling. COMAP. http://www.comap.com/undergraduate/contests/. Accessed 17 May 2016. [SIMIODE2013] SIMIODE. 2013. Systemic Initiative for Modeling Investigations and Opportunities with Differential Equations. www.simiode.org. Accessed 1 May 2016. [SIMIODEYoutube2014] 2014. SIMIODE YouTube Channel. https://www.youtube.com/channel/UC14lC-tyBGkDPmUnKMV3f3w. Accessed 1 May 2016. [Winkel1997] Winkel, B. J. 1997. In Plane View: An Exercise in Visualization. International Journal of Mathematical Education in Science and Technology. 28(4): 599-607. [Winkel2008] Winkel, B. J. 2008. Fourier Series: Optimization Opportunity. International Journal of Mathematical Education in Science and Technology. 39(2): 276-284. [Winkel2014] Winkel, B. J. 2014. 1-1-S-MandMDeathAndImmigration. https://www.simiode.org/resources/132 . Accessed 15 May 2016. This entry was posted in Assessment Practices, Classroom Practices, Multidisciplinary Education, Student Experiences and tagged Differential equations, modeling. Bookmark the permalink. Thank you. What makes it great is the name (paraphrase) of a musical series we attend in NYC, but I wonder what makes the posting or I should say the ideas on using modeling in differential equations great for you? Let me hear from you. The author of the post.